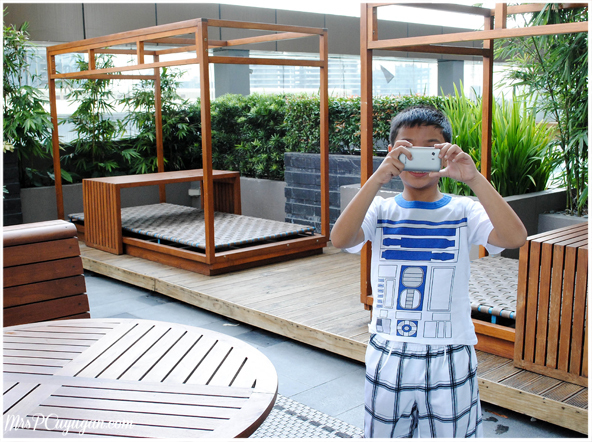 So, last month the boys and I went on a staycation at F1 Hotel in BGC. During our stay, we were eating about 80% of the time. I’m not kidding! It even started with food. As in, there was food laid out at the Premier Lounge when we arrived. 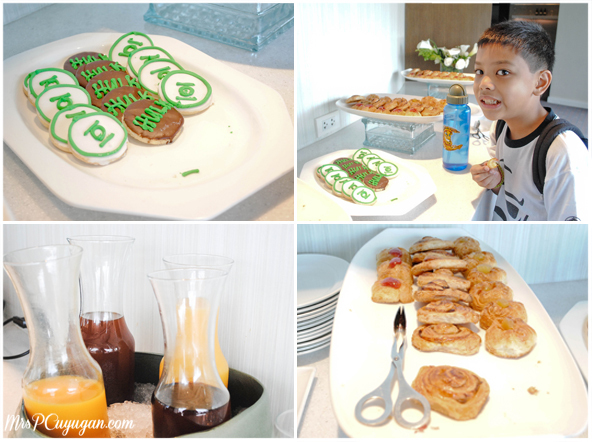 This boy was the most excited over the cookies and pastries that were laid out! After a short welcome program, we were sent off to the hotel’s restaurant, F All Day Dining, for lunch. We were treated to a preview of their Christmas menu, and I was excited about having holiday food in October. I love to eat and I love the holidays, so when you put those two together, you make one happy me. I started out with the usual suspects: soup, salad and sushi. I remember my friend Jane asking why I was having a salad, and I told her that it was just the beginning. Best to get the vegetables out of the way early on. 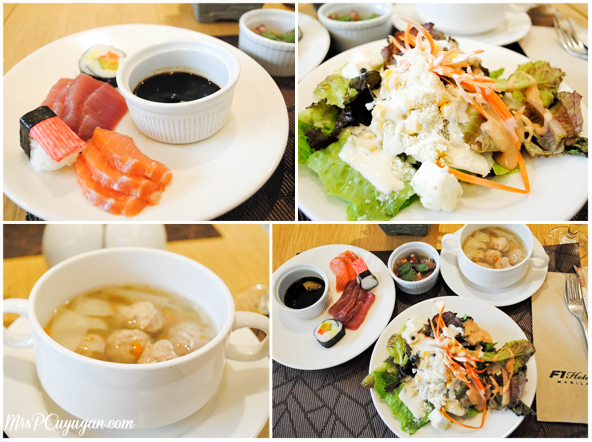 I also can never skip sushi and sashimi at buffets. Those are must-haves for me, and I really enjoyed the sashimi at F1. I was happy to see they had molo soup, which is also a favorite. It was good, but needed a pinch more of salt and pepper for my taste. And then came the holiday goodness. There was stuffed turkey, glazed ham with pineapple, cherries and candied fruit, beef morcon, lamb caldereta, chicken galantina, and roasted salmon with orange and rosemary beurre blanc. There were also dishes being served that weren’t part of the holiday menu, but I chose to dive into the Christmas feast and pretty much ignore the rest. The star of the holiday feast, for me, was of course the stuffed turkey. I love, love, love turkey, and this one was pretty good. I also enjoyed the glazed ham . No matter how simple this dish may be, ham gives me this Christmas morning feeling and that’s why I love it. Yes, I still had room for dessert after all of that. 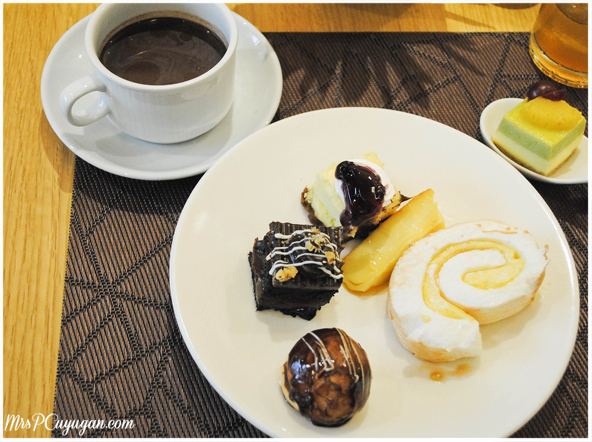 I was eager to try all the small cakes that were laid out, and also the chocolate fondue. I don’t know about you guys, but those things make me feel like a kid! There was also churros and tsokolate, which I love! My friends, Jane and Joei and I played around a bit at the tsokolate station, as you’ll see in the next photo. 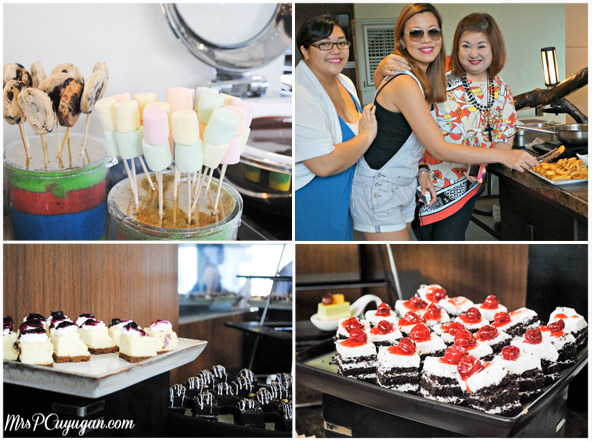 Fondue, churros, cheesecake, chocolate cake, black forest cake – Dessert Heaven! I think I liked the cheesecake best, and also the tsokolate. I wanted to get some fruit but I had absolutely no more space for it. And that was why I went straight for the salad before anything else! Habang may space pa. I really would have wanted to nap after lunch, but we had to leave to catch a party in my aunt’s house nearby. We tried our best not to eat so much at the party because we knew we had a dinner feast to look forward to at the hotel that night. Originally, the plan was for us to have an outdoor barbecue at the poolside Canary Lounge but the weather just refused to cooperate. So instead, we had our meal at the restaurant again, but this time we were served yummy grilled meat and seafood at our tables. 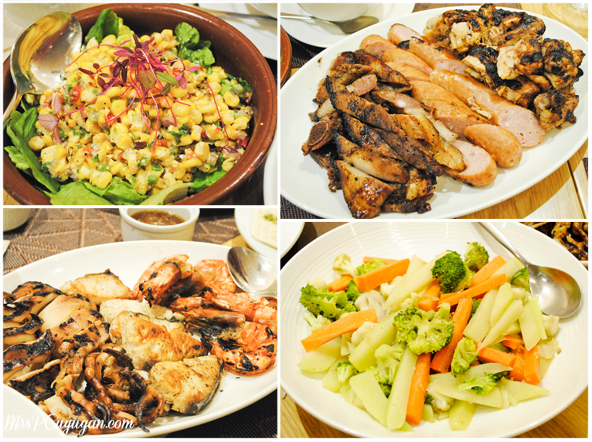 My choice of side dishes! I slept super soundly that night with a happy tummy and a happy heart. The next morning, I woke up earlier than the boys did. I wanted coffee but I was too lazy to make some. Then I remembered that there was an uneaten quezo de bola cheesecake sitting in the living area of our suite! So I happily ate that all by myself, first thing in the morning on a Sunday. What a fun way to wake up! My idea of happiness is having breakfast that I didn’t have to prepare myself. That, for me, is such a luxury, and one of the best parts of any staycation. Back at the restaurant, I finally got my coffee. I also had a glass of apple juice. I wasn’t very hungry so I only had a small plate (yes, small na yan for me!) of with waffles, a pandesal, a cinnamon roll, puto, bacon, the yummiest, fluffiest scrambled eggs ever, and vegetable gratin. I wasn’t able to take photos of the breakfast spread because the stations were due for a refill while we were there, so they wouldn’t have made nice photos anyway. I may have been full, but I wasn’t satisfied. 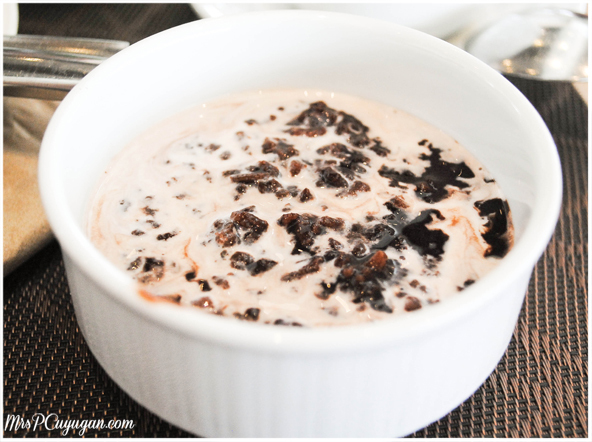 I had been eyeing the champorado all morning, and finally I decided to give in. I’m glad I did because it was the best part of my entire breakfast. I would have regretted not going for it. You complete me. Or at least my breakfast. We didn’t try the other hotel facilities because we really just wanted to relax and rest that weekend. F1 does have a nice gym and spa, and 3 swimming pools! After breakfast, Little MrC and I went to check out the pools so I could take photos. There were a lot of people swimming, though, so there was more kiddo than there were pools in my pictures. Oh well! See the pools in the background? 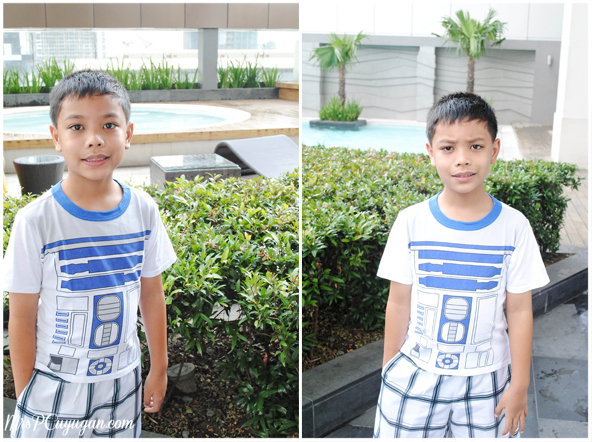 We slept well, ate well, enjoyed the company, and had fun in general at F1 Hotel. All in all, it was a great staycation. Those of you who are planning a visit should come during the holidays because there is a lot to look forward to then – special room rates, Christmas and New Year’s Eve mass, Christmas carols, and that Christmas buffet. 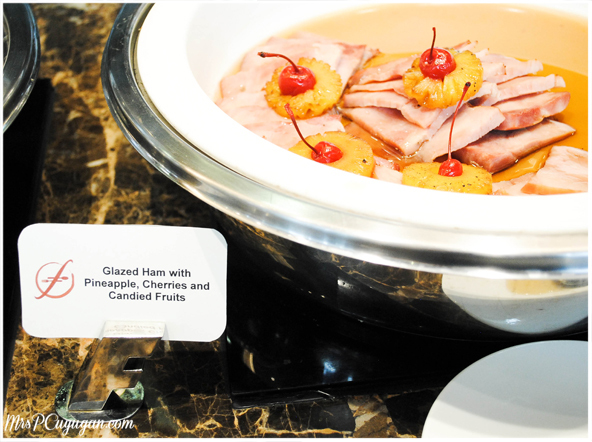 Lunch and dinner buffet at F All Day Dining costs PHP 1,399 nett. 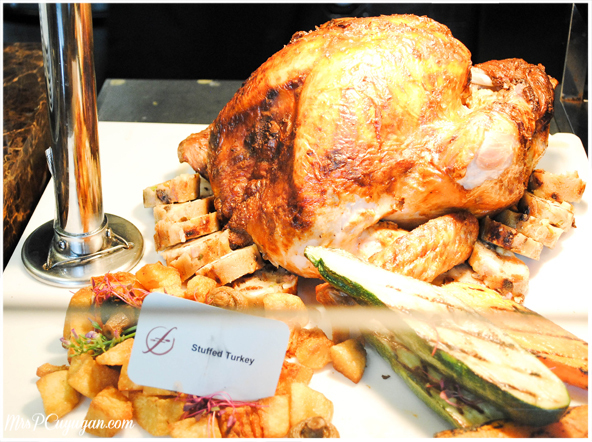 The special lunch and dinner buffet on December 24, 25, 30, 2014 and January 1, 2015 costs PHP 1,999, and comes with a glass of wine. 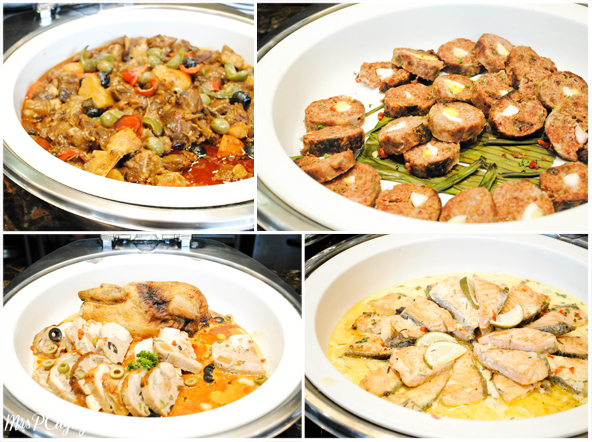 Special lunch on December 31 is PHP 1,999. 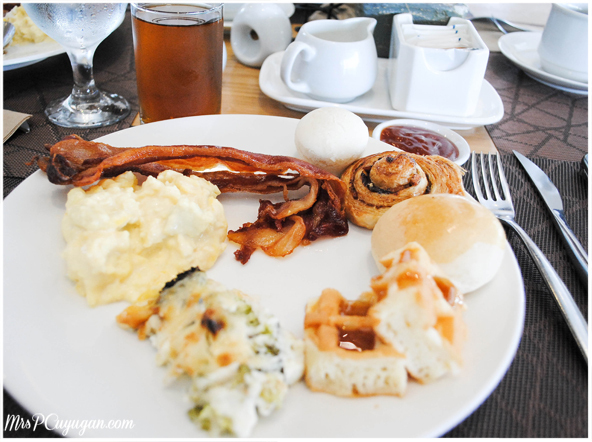 Special dinner on December 31 is PHP 2,999, inclusive of one (1) New Year’s Countdown Party Ticket. Again, THANK YOU so very much, Mr. Tony Co and Pau of F1 Hotel for having us. We enjoyed our stay. Thank you also, Spanky and Jane, for including us in your guest list. We are truly grateful. 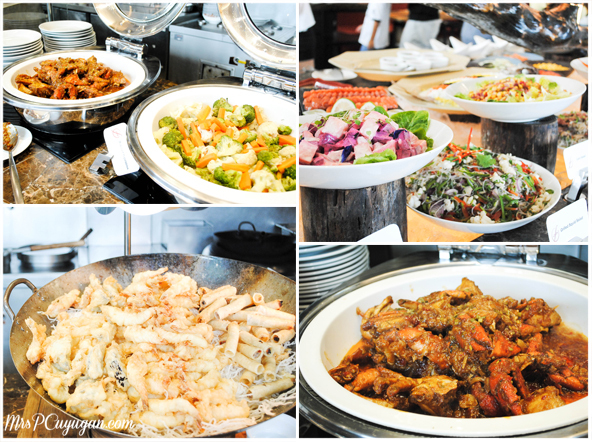 I love the food there at F1 Hotel! Everything is good! I love Christmas menu too, and I can’t wait for December to come. By the way, what’s a Molo Soup? Never heard of it before. The food looks yummy glad that you had a great time in F1. I was just editing food photos before reading this. The combination of all these photos made me super hungry! 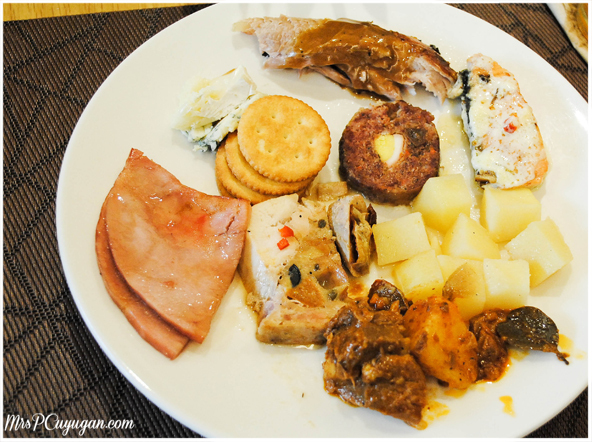 The buffet spread at F1 looks really good, but like I told you a few days ago, I think we’re not going to buffets again any time soon. Haha! Hindi na kaya ng powers kumain ng madami. But I’d love to experience a staycation there! OH MY GOSH :O FOOD!!!! And for the price ha, it’s really worth it! 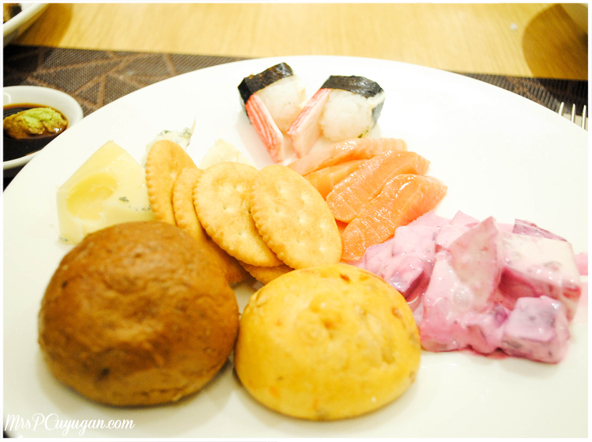 I like the food at F1 hotel. It’s nice that they have this new offering for guests. Aww. beef morcon is my favorite! I haven’t eaten a turkey yet but I love to try it here. Everything looks yummy. Grilled squid is my ultimo favorito! You got yourself an early thanksgiving meal right there, how was the Turkey? I so envy all your staycations, wish we can do the same. wow!!! !there are so much delicious dishes..by the way nice pictures as well of these delicious dishes.Nice work.